If the defendant has an excuse or reason for not being on the scene of the crime when it took place, his defense is what is called the alibi defense. In Latin, the word “alibi” means in another place. By having witnesses to prove and testify that the alibi is true, the alibi can be supported. An alibi defense is considered successful if it acquits the defendant of the crime he/she is accused of. What Does an Alibi Consist Of? An alibi must have evidence that shows that he/she was unlikely to be in the place of the crime where he/she was accused of being in the first place. The evidence must state in the defense statement all the details that will confirm that he/she was not on the scene of the crime when it happened so he/she could not have committed the crime. An alibi defense may consist one or some of the following: a signed document, a video, credit card transactions, telephone logs, bank or credit card receipts, employment time card, and photographs. The witness in an alibi defense has the capacity to weaken or strengthen the defense. If the witness is not a relative or a friend of the defendant, it will benefit the defendant significantly. Family and friends are more likely to lie for the defendant, which is the reason why they are not the most credible witnesses for alibi defense. If there is also more than one person who can testify for the alibi of the defense, it will further strengthen the case. If you are going to use the alibi defense, you must know that most courts require that you notify the prosecution. The notice of alibi requires a defendant to give a notice when he intends to use a witness. He / she must disclose who the witness is and where the accused was when the crime took place. It is the government’s obligation to notify the defendant when there is a witness so that the testimony can be rebutted. Failing to comply with this requirement may jeopardize the chance of the defendant to present the alibi defense on trial. The prosecution can interview the witness of the defense before the trial. 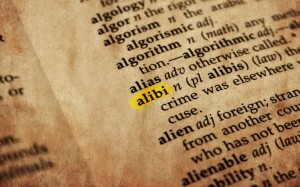 The alibi defense can be one of the most effective defenses to criminal charges. To learn more about the alibi defense and how to build a strong case, it is best to consult a reputable defense attorney.